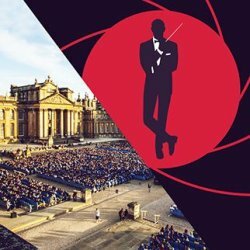 The line-up for this summer’s Nocturne open air concerts features The Royal Philharmonic Concert Orchestra performing a selection of music from classic Bond films in the Great Court at Blenheim Palace on Saturday June 25th. Presented by former Bond girl Fiona Fullerton (A View To A Kill), and featuring guest vocalists Mary Carewe and the West End's Simon Bowman (Miss Saigon, Les Miserables, Phantom). They will perform themes from films including Goldfinger, From Russia With Love, Live & Let Die, Licence to Kill, Skyfall and Spectre under the direction of conductor Richard Balcombe.